It’s probably obvious that I haven’t been keeping up with the most recent video games. Back in the day, even though I wasn’t good at most games, I could at least watch someone else play. That’s not been so much the case since the Super Nintendo era. Still, I’m interested in the world-building surrounding some long-running series, so I do research on them to remain somewhat current. There are a LOT of videos on YouTube about the best and worst power-ups in the Mario series. One video broke down the different sorts of power-ups, exploring the various sorts of mushrooms, flowers, and suits, among others. The Japanese Super Mario Bros. 2, released in the States as The Lost Levels, introduced poison mushrooms. New Super Mario Bros. brought in Mega and Mini Mushrooms, and the Galaxy series has several mushrooms that perform transformations akin to the suits. New Super Mario Bros. Wii has another suit, that of a penguin. Ice Flowers have become pretty standard, and flowers in other games grant the ability to produce Superballs, gold coins, boomerangs, and clouds. Some games have unique power-ups, like the caps in Super Mario 64. By this point, I’m not sure there’s really much rhyme or reason to which sort of item does what, although a good number of them involve a physical transformation for the user. Mario and his companions have gained powers based on multiple animals: bees, rabbits, frogs, tanukis, flying foxes, flying squirrels, cats, and penguins. Others give the abilities of enemies, including Hammer and Boomerang Bros. and Boos. Magus in Captain SNES referred to the power-ups as shamanistic magic, which makes sense. 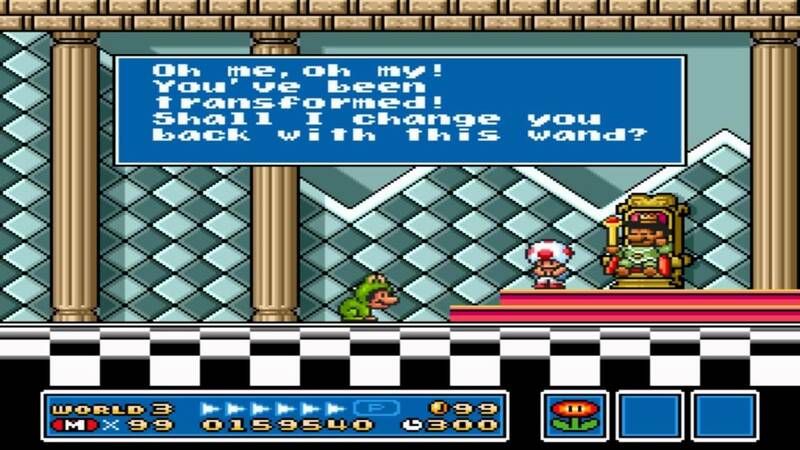 It’s interesting that the animal suits first show up in a game in which the Koopas transform kings into animals, which is acknowledged when you finish an airship with a Frog Suit. 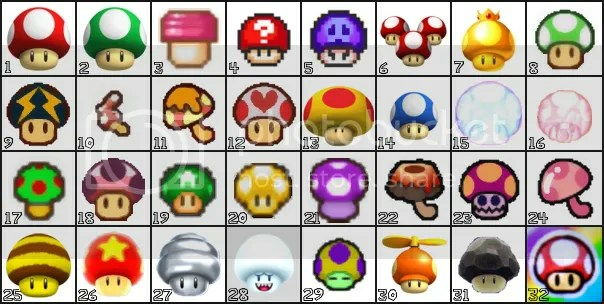 Some years ago, I wrote a post with somewhat facetious (but then, it IS Mario) explanations for the origins of power-ups. Apparently there’s since been an official explanation for Super Leaves, that they grow on Tail Trees. There’s also a plant that grows such leaves in a Nintendo Comics story, “There’s Always Fair Weather,” perhaps an offshoot of the main tree. Seems like they’d be easier to find if their main source is known, but maybe it doesn’t bear leaves all the time. 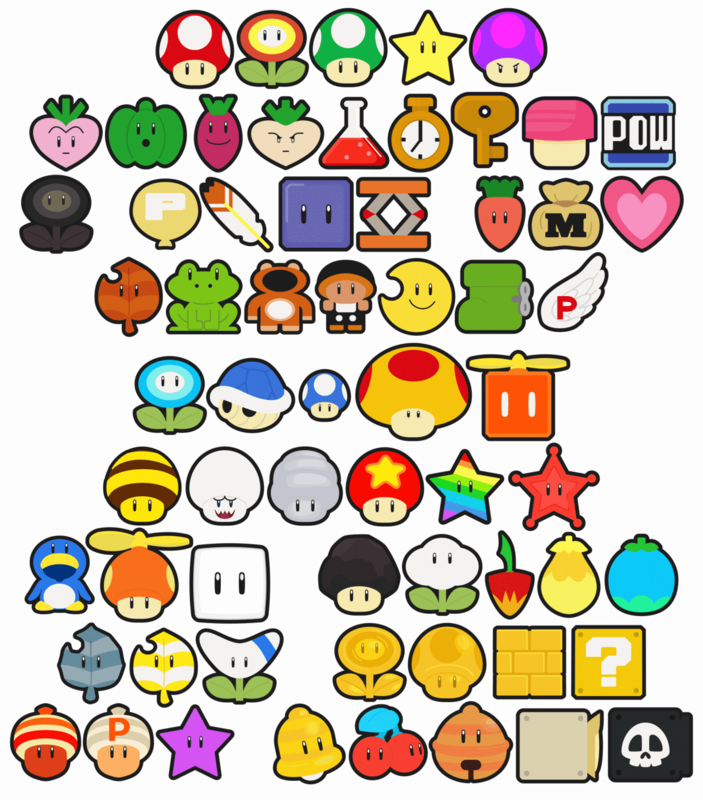 A question I’ve had for some time is whether anyone can use the power-ups in the Mario series. Does anyone who comes across a Fire Flower gain the power to shoot fireballs? If so, why don’t the ordinary citizens ever use them? For that matter, why don’t the bad guys? Well, sometimes they do. 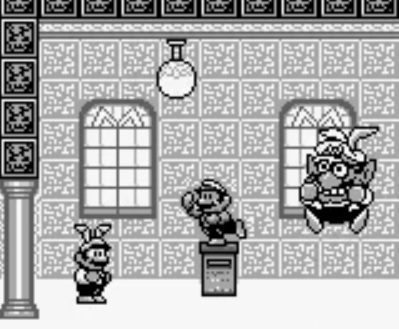 At the end of Super Mario Land 2, Wario uses both a Fire Flower and a carrot to fight Mario. Much of the time, however, Wario has his own sorts of power-ups. So do the Yoshis, although maybe that’s primarily to avoid situations like this. 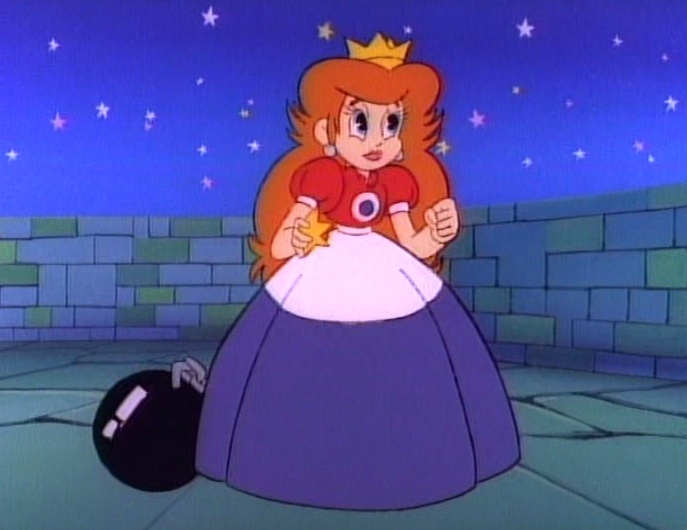 The Super Mario Bros. Super Show cartoons had a weird attitude toward power-ups, as Fire Flowers and Super Stars seemed to do the exact same thing, both granting extra strength and the ability to shoot fireballs. This is one of many occasions when I think the writers might not have ever played the games, or even read the manuals. It’s usually Mario and Luigi who use the flowers and stars, but Toad and the Princess sometimes do as well, and they work just as well for them. 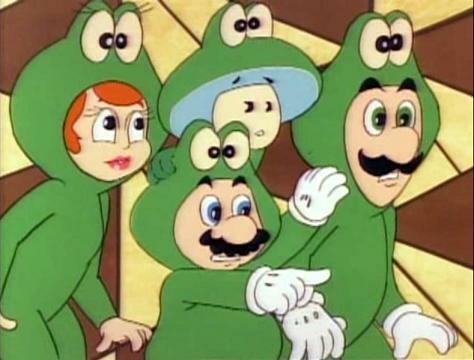 The same was the case in the Super Mario Bros. 3 cartoon, with Toad and Peach (or Toadstool, as she was then known) using Super Leaves, Frog Suits, and P-Wings. Oddly, they never used Fire Flowers. There was also an episode where Ludwig von Koopa (called Kooky in the show) invented a pendant that would give his father the ability to use the same powers as the Mario Brothers, but it wouldn’t work in the Mushroom World. You wouldn’t think he’d need fireballs, since he can breathe fire, but he never did in the cartoons. His powers were somewhat better than those the plumbers have, as he was once shown using raccoon and fire powers along with Kuribo’s Shoe. 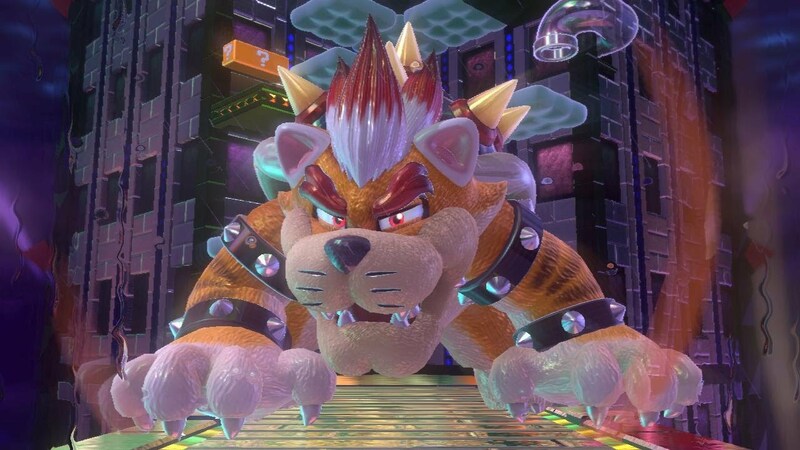 He’s done this quite a bit in the games as well, and in the more recent games, Bowser seems to have no problem using the same power-ups as the heroes. In Super Mario 3D Land, he uses Super Leaves to give himself and his minions Tanooki powers, and he utilizes a Lucky Bell and some Double Cherries in Super Mario 3D World. Has he always been able to do this and just hadn’t thought of it? Is it a new ability for him? Does it only work in this particular series of games? I would like to note that, in Super World, there are Koopas with capes that Mario and Luigi can stomp to obtain their own Cape Feathers, suggesting they were using the feathers themselves. 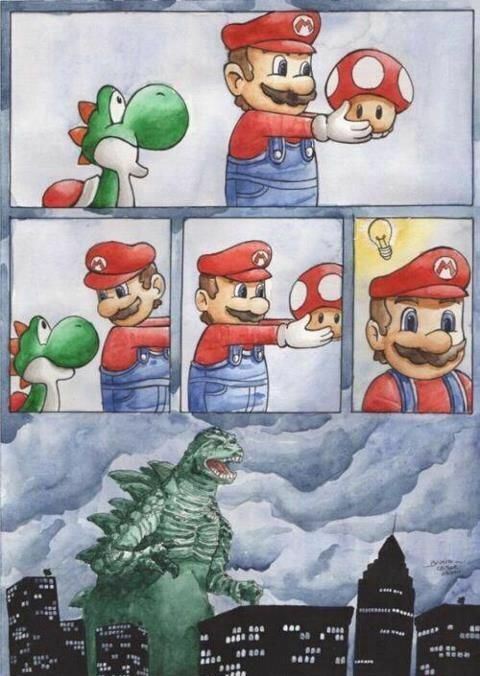 This entry was posted in Animals, Cartoons, Comics, Magic, Mario, Super Mario Bros. Super Show, Television, Video Games and tagged captain snes, king bowser koopa, koopalings, luigi, magus, mushroom world, mushrooms, new super mario bros., power-ups, princess peach toadstool, super mario 3d land, super mario 3d world, super mario bros. 3, super mario land 2, super mario world, tanuki, the lost levels, toad, wario, yoshi. Bookmark the permalink.